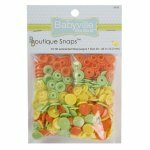 Colored plastic resin snaps are the perfect closures for a variety of projects. Easy to attach using Babyville Boutique Snap Pliers (sold separately) and are safe for baby and children’s items including cloth diapers and diaper covers. Ideal for rainwear- pouches and pet projects. Bright colors and cute designs coordinate with Babyville Boutique PUL - appliques – labels – size tags and iron ons. 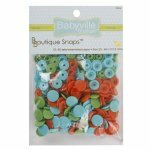 Babyville Boutique Pliers (item #35039-sold separately) are required for easy application of snaps. Machine wash warm-tumble dry medium heat. Do not bleach. For added stability, add an additional scrap of PUL or other stabilizer behind snaps either in the seam or on wrong side fabric. Warning: Choking Hazard – small parts. Not for Children under 3 yrs.